Still one of the nations favourites, gin has enjoyed a long standing fame amongst the people of England! A timeless classic steeped in history, it’s the go to spirit all year round. A beautiful summer cocktail and a warming Christmas drink, gin is both unique and versatile. For the gin aficionado however, picking the right gin to gift them is a fine art. That’s where we can help! 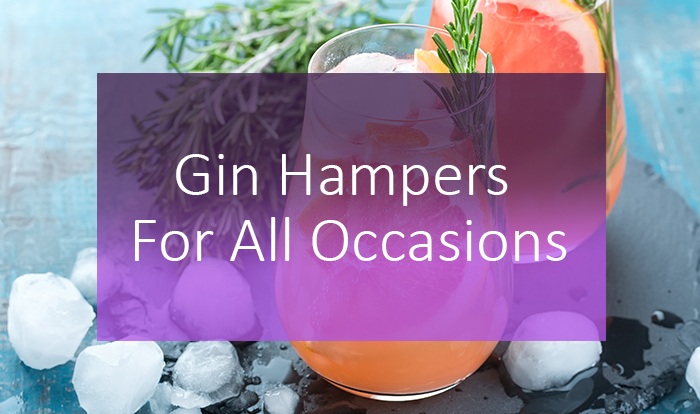 Our gin hampers contain carefully selected products to accompany premium gins and mixes. 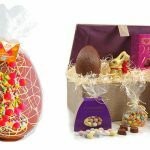 Take a look at some of our selection below. You can view the full range here. 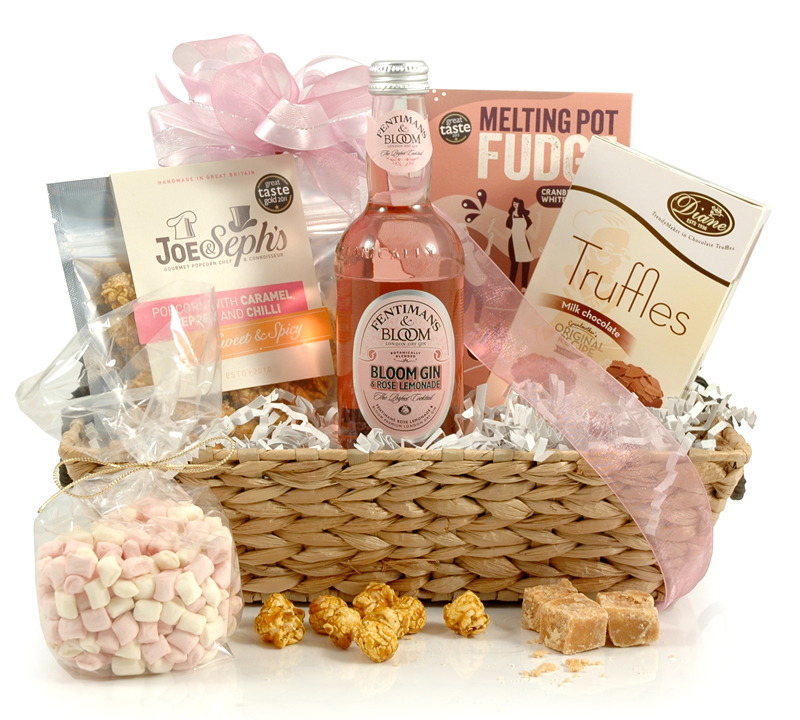 A modern twist on a classic, our Bloom Gin & Rose Lemonade hamper is one of our most popular gin hampers. All packed inside an adorable woven basket, is a selection of delicious treats that surround the bottle of Bloom Gin and Rose Lemonade. 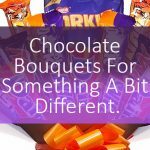 The popcorn is infused with fiery chilli and caramel, and perfect accompaniment to the the sweetness of the chocolate truffles and fudge. 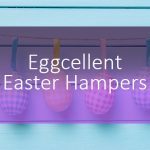 The fluffy pink and white marshmallows add an extra touch of joy to this hamper. Great For: Birthdays. Christmas. Gifts For Her. 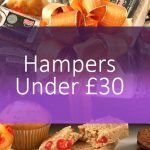 The perfect gin hamper to give as a gift to somebody who also has a sweet tooth, our Tarquins Gin Hamper is the perfect choice. The Tarquin’s Handcrafted Cornish Gin sits nestled inside a beautiful woven basket. A host of delights surround the gin, each one carefully selected to compliment the dryness of the gin. Treat them to coconut and hazelnut biscuits, creamy fudge and gin and tonic infused popcorn. Great For: Birthdays. Christmas. 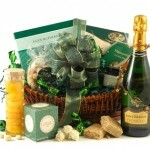 Corporate Gifts. 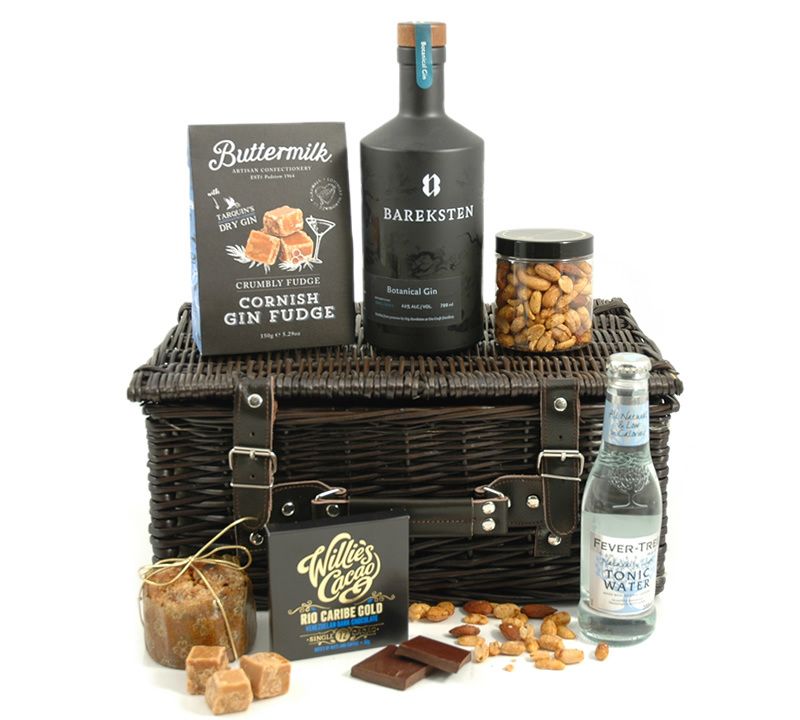 A wonderful Christmas present for any gin fan, the Bareksten Gin Hamper will make a big impression. 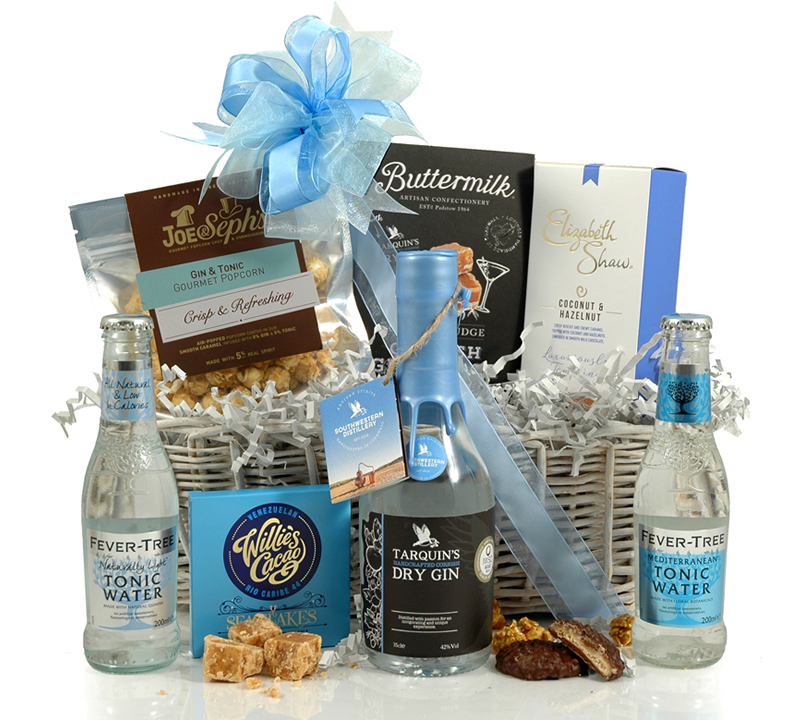 The deep chocolate brown basket houses the award winning Bareksten Botanical Gin, accompanied by a bottle of light tonic water for the lucky recipient to mix their favourite cocktail. 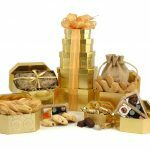 They won’t be able to resist the crumbly fudge, and moorish fruitcake. The dry roasted peanuts and Peruvian dark chocolate add a layer of deeper flavour to the selection. Great For: Christmas. Congratulations. Gifts For Dad.